the apartment was lovely and had everything we wanted.would definately book it again. Appartement dicht bij metro/treinstation Clot Prima locatie om overal in Barcelona te komen. The location was very good. It was clean and comfortable beds. Tout était parfait ! Nous sommes très contents ! This bright 3 bedroom apartment situated in the neighborhood of Sant Martí, is the ideal choice for a group of friends or a family visiting Barcelona. It´s situated away from the hustle and bustle of the Old Town but within walking distance to some of the best city sights like the Sagrada Familia and Glòries shopping centre. The apartment has three bedrooms, one with a double bed and a big wardrobe with mirror, while single beds are distributed throughout the remaining rooms, also equipped with wardrobes and shelves. The luminous living room has a large sofa and a TV, where you can relax after a day of sightseeing. This apartment has one bathroom. The kitchen is fully equipped with the all utensils necessary to for you prepare your home made meals, including a coffee machine, toaster, oven, microwave, pots and pans. There is also a bright terrace where you can find a table and three chairs to enjoy your coffee in the morning. 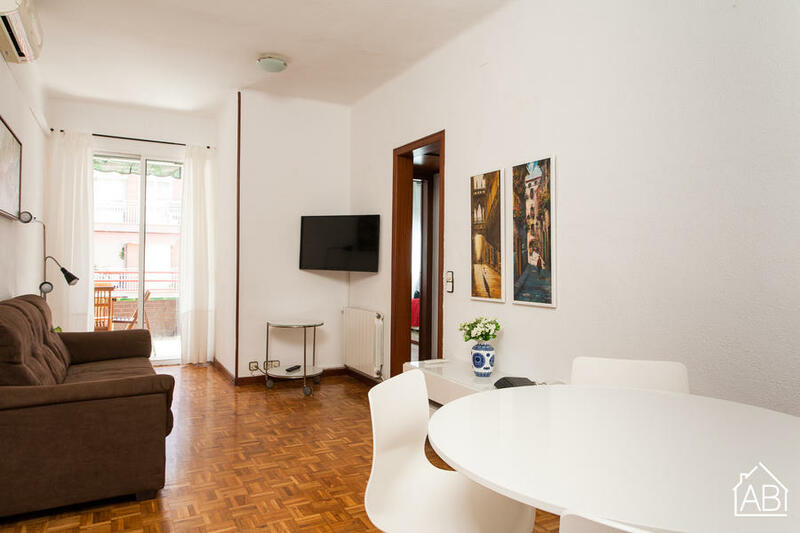 The apartment has everything you need for a comfortable stay in Barcelona: Internet, air conditioning and central heating, perfect for a visit to Barcelona any time of the year.